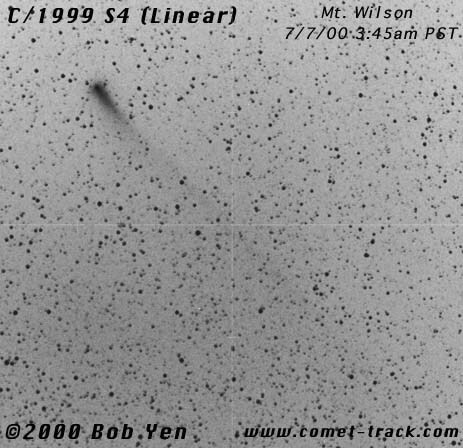 Explanation: Comet LINEAR's tail appears to be extending. Many sky watchers are closely following Comet C/1999 S4 LINEAR and wondering if it will develop an impressive tail or become visible to the naked eye later this month. So far, the unpredictable comet is moving oddly indicating that exploding caverns of heated gas are causing the comet to shift slightly in its orbit around the Sun. 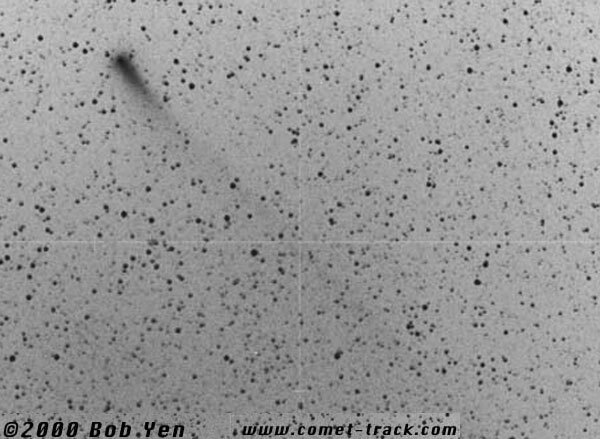 This volatility contributes to Comet LINEAR newly visible two-degree tail, discernable in the above photographic negative taken Friday from California. Current brightness estimates indicate that Comet LINEAR will just barely become visible without binoculars in northern skies in the days surrounding July 23 during the early evening hours.